Saturday 25 May 2019: Reading DX meeting - Reading International Radio Group 1430-1700 BST in Room 3 at Reading International Solidarity Centre (RISC), 35-39 London Street, Reading RG1 4PS. Further details Mike Barraclough 01462 643899 email barraclough.mike [at] gmail.com**. Thursday 21 June 2019: BBC World Service annual mid-winter broadcast to British Antarctic Survey to BAS staff working in Antarctica on midwinter's day in Antarctica. The schedule in 2018 was 2130-2200 UTC on 5985-Woofferton(UK), 7360-Ascension Island, 9890-Woofferton. Saturday 6 July 2019: Dorset DX Gathering - at Durlston Country Park near Swanage, BH19 2JL. An opportunity to meet fellow members at an FM DX hotspot in the county. Nearby cafe/restaurant with superb views over Studland Bay. Details mailbox [at] bdxc.org.uk**. Saturday 27 July 2019: Reading DX meeting - Reading International Radio Group 1430-1700 BST in Room 3 at Reading International Solidarity Centre (RISC), 35-39 London Street, Reading RG1 4PS. Further details Mike Barraclough 01462 643899 email barraclough.mike [at] gmail.com**. Friday 6-Monday Sunday 8 September 2019: European DX Council Conference 2019 in Andorra Registration will open on the afternoon of Friday 6 September and the conference will start that evening. Conference sessions and excursions (still at the planning stages) will run on Saturday 7th and Sunday 8th September. We are also looking at possibilities of an EDXC visit to Toulouse after the conference. The following meetings are held regularly. Feel free to go along and enjoy the chance to meet fellow radio enthusiasts! Details of the dates of future meetings are in the next section. Reading DX Meeting - going strong for over 30 years! A Saturday in mid Summer has become a firm favourite event on the BDXC calendar. A lazy summer afternoon by the Thames supping a pint and chatting about anything and everything - though naturally radio is top of the agenda! - is the prospect and for those that wish to do so an Indian meal at a nearby restaurant follows at about 7pm. If you want to come to the meal please be sure to let us know well in advance so that we can book a place for you. Photo taken at our Twickenham DX meeting on 29 June 2013 (left to right: Gareth Foster, Alan Roe, Mark Savage, Mike Barraclough, Colin Ferris, Mike Terry, Dave Kenny, Chris Greenway, Stephen Howie, Darren Rozier, Michael Blake, Sergej Rogov, Chrissy Brand, Alan Pennington). 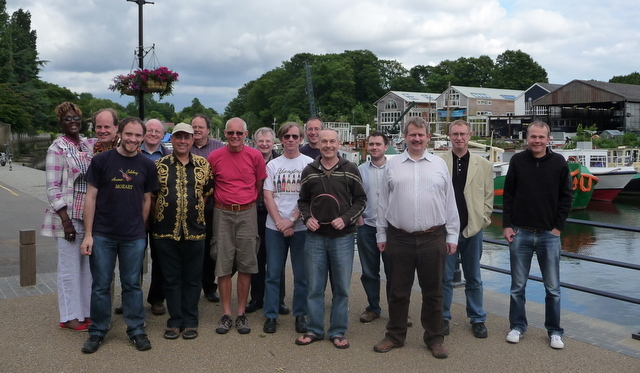 Photo taken by the River Thames at our Twickenham DX meeting on 19 June 2010 (left to right: Merub Greenway, Chris Greenway, Darren Rozier, Mike Barraclough, Gareth Foster, Mark Savage, Mike Terry, Alan Roe, Colin Ferris, Ian Kelly, Dave Kenny with Tecsun AN-200 MW loop, Stephen Howie, Steven Overall, Stuart Heathcock, Alan Pennington).